The Keys to Your Next Building Project! 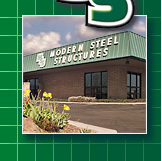 The Central Valleys finest builder of pre-engineered metal structures... since 1964! Click on the links below for a quick tour of our site. And if there's anything else you'd like to see here, please let us know! Read more about our company, and the experienced personnel that make us who we are! Industry recognition may be the icing... but your satisfaction is our greatest award! Find out more about us by who we associate with.